Menno Simons College (MSC) is pleased to offer both entrance scholarships and returning student scholarships to students planning to complete the Conflict Resolution Studies or International Development Studies program. these awards are in addition to the awards that full-time students are automatically eligible for through the University of Winnipeg's Awards and Financial Aid Office. All awards administered by MSC are composed of funds donated by friends of the College. These include scholarships and bursaries that are typically awarded in the fall according to various criteria. The majority of returning student scholarships are processed in April of each year; entrance scholarships are processed in September of each year. MSC also has bursaries available that are processed and awarded as needed and according to funds available. Scholarship amounts range from $300–$1,500 per year. Candidates for scholarships must be registered in a minimum of 9 credit hours in both the Fall and Winter semesters, 3 credit hours of which must be International Development Studies and/or Conflict Resolution Studies courses. Scholarships are awarded primarily on the basis of academic performance, with some consideration of the student's history of community service, extracurricular activities, leadership experience, or challenges overcome in the pursuit of education. Students must have all application components submitted prior to the deadline outlined on the application form. MSC Entrance Scholarships are awarded to students entering their first year of university level studies. Students must be enrolled in Introduction to Conflict Resolution Studies or Introduction to International Development Studies. 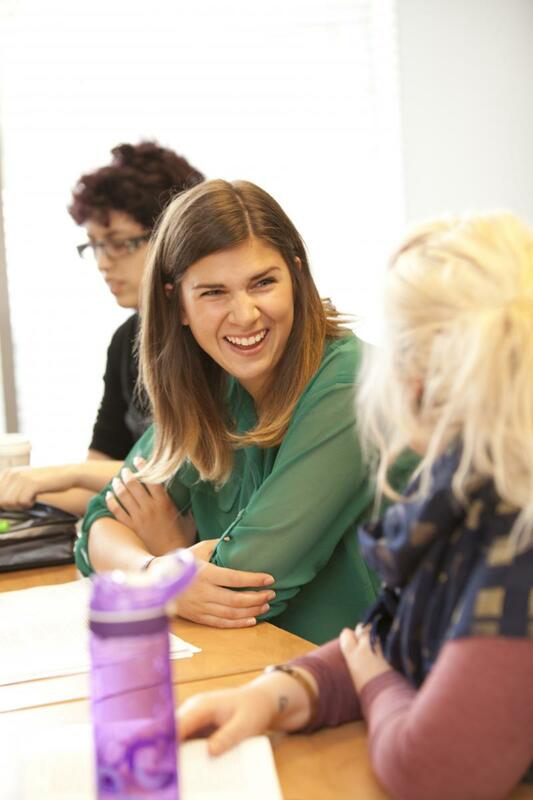 Select MSC Scholarships are designated as Multi-Year Scholarships. Students receiving these scholarships will be awarded funds on an annual basis for up to three years. Students must achieve a minimum GPA of 3.5 in order for their scholarship to be renewed each year. A written statement indicating the student's intention to renew and a copy of the student's transcript (printed from WebAdvisor) must be submitted by June 30 of each year. Candidates may apply for an MSC Bursary towards tuition for the Fall, Winter or Spring semester. 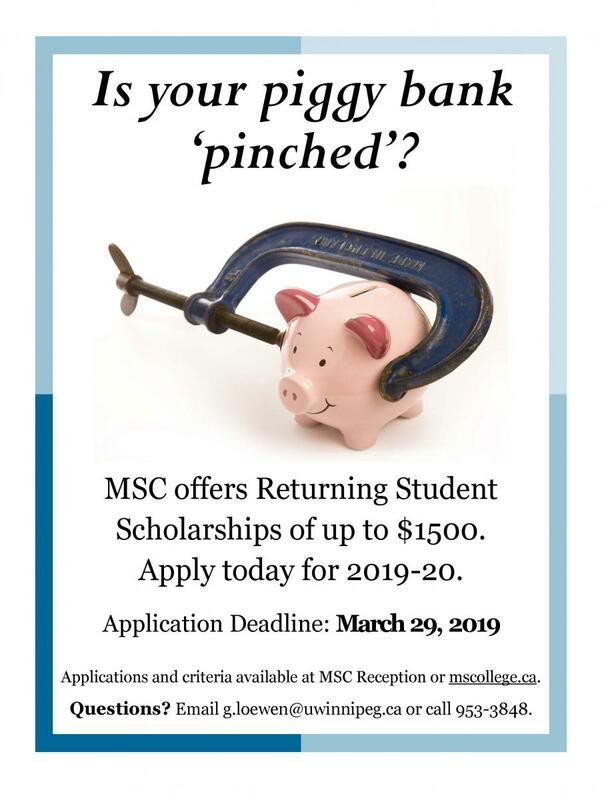 The MSC Scholarship and Bursary Committee reserves the right to not award a particular scholarship or bursary in any year when there are no funds available and/or a student does not meet the criteria for eligibility. Download a list of scholarships available to students enrolled in Conflict Resolution Studies and/or International Development Studies. Questions regarding scholarships and bursaries may be directed to Gina Loewen, MSC Academic Advisor, at 204.953.3848 or g.loewen:@:uwinnipeg.ca. All Menno Simons College students are encouraged to apply for government student aid programs and for The University of Winnipeg Faculty of Arts and Science awards. The University of Winnipeg Undergraduate Student Awards Program is one of the most extensive in Canada. The University of Winnipeg publishes a separate Awards Calendar which contains information about scholarships, bursaries, prizes, medals, government aid programs, and other awards available to students.